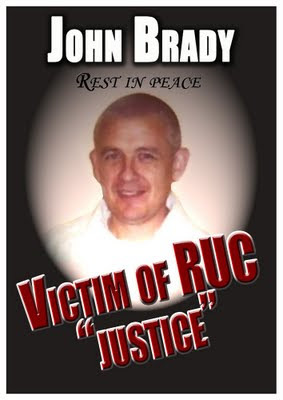 On behalf on the 32CSM I would like to extend our deepest sympathies to the family of John Brady who died whilst in police custody. We echo the concerns of the family and the broad republican movement that answers surrounding the circumstances of John’s death be immediately forthcoming. The issue of sustained harassment of republicans by British forces cannot be divorced from the search for those answers. Equally the use of the ‘Release Under Licence’ system as a mechanism to coerce political expression and as a blunt instrument to re-intern republicans on the flimsiest of grounds needs to be fully exposed. We offer our full support to John’s family in their quest for the truth concerning his death.